My experience with Asian cuisine started late in life – sushi, curry, stir-fry, dim sim, dhal, naan, tepanyaki, varieties of noodles and rices – I had little idea what they are, in fact, I had little idea they existed until my 20s. And then, once we met, it was a love at first sight. Maybe the first bite of raw fish didnt win me immediately, but the second had me for life. Since then I have been discovering and discovering this never ending cave of taste adventure, because if someone can say they know all that there is to know about Asian cuisine, I can assure you they are lying or writing a book. The variety, the tastes, the combinations know no end. I present to you my latest discovery – glutinous rice. No, it has no gluten, its stickier than the usual rice, hence its also called sticky or sweet rice. It has a very appealing look – opaque white, like little white stones. I had no other rice to show you the difference, but Blazing Hot Wok, has a great image of this rice next to the more familiar to us varieties. 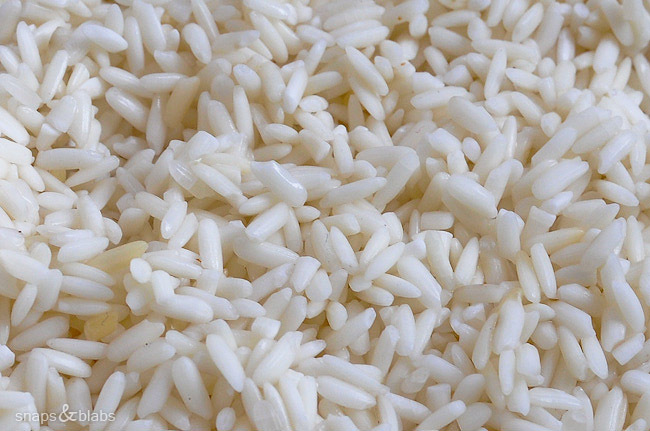 Glutinous rice is used all around SE Asia and is the main type used and grown in Laos. It can be used by itself, as a side dish, usually eaten by hand with an incredible dexterity – a process I can look at for a long time. Usually food is eaten with the right hand (considered clean) and everything is done with it, be it breaking up roti bread, picking up juicy sauce with a rice ball fashioned scoop. It may sound easy and messy, but it is none of those, I assure you. Only the tips of the fingers are touching the food and the grace, speed and precision have to be seen to be believed. Back to sticky rice. I learned how to do the most wonderful desert from a Indian-Malay woman in Amed. First wash and leave your rice to soak for at least 3 hours. Glutinous rice is less dense than normal rice and soaks up a lot of liquid, which makes the next step possible and successful. Drain the rice and steam it. 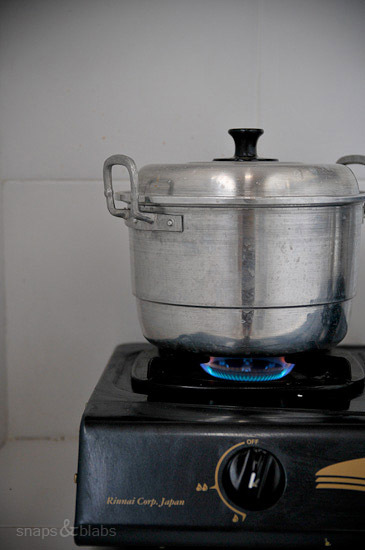 Its not possible to steam normal rice, but because glutinous rice can hold a lot of liquid, this sort of cooking works. I had a simple pan with a little steamer insert on to which I put the rice. This step didnt take long at all. Maybe 10-15 min. Try the rice from time to time, it should be firm, but not crunchy. It also gets more translucent when cooked. Get the rice out into a bowl and while its hot add your coconut milk. I used the one I made a bit earlier and basically kept on adding until it became glistening. 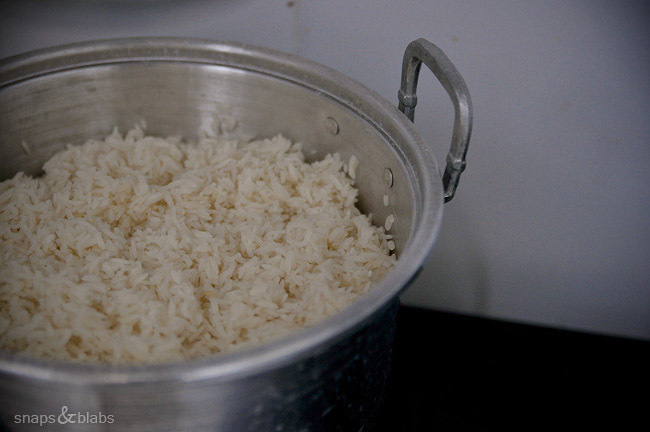 The rice absorbs the liquid, so keep an eye on it, because you dont want it to be a soup. In the picture it looks gluggy, but the grains are whole and kept their shape very well. 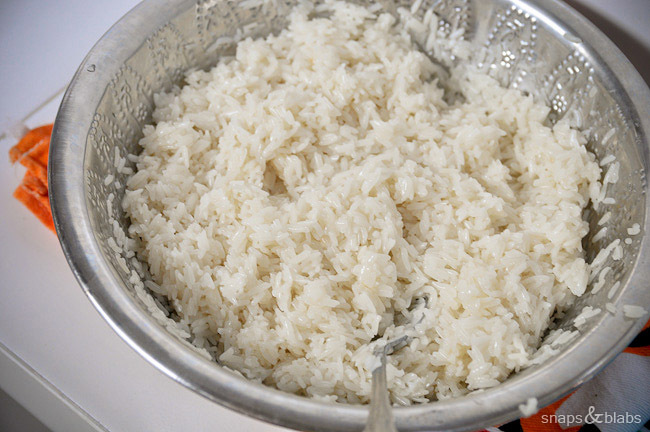 Put the rice aside, or in the fridge, if you want your sticky rice cold. This is yet another ingredient I had not explored before, but after seeing it in the market, a pile of dark brown half ovals, I was excited to see what it can do. There seems to be a little bit of a confusion as to whether coconut sugar is the same as palm sugar. Some sources say it is, while others say differently. All I can tell you is that coconut sugar is delicious. It has a deep caramel taste with a bit of maple honey hints. Take a little pan and put a few blocks of your sugar with some water. You are basically making a syrup. Once melted, simmer it for a few minutes until it looks syrupy. The white of the meat gets lost in the brown bubbles and before long, you have yourself a lip smacking topping for anything you desire – pikelets (yum, tried it), toasts, crepes, you name it. Or sticky rice. 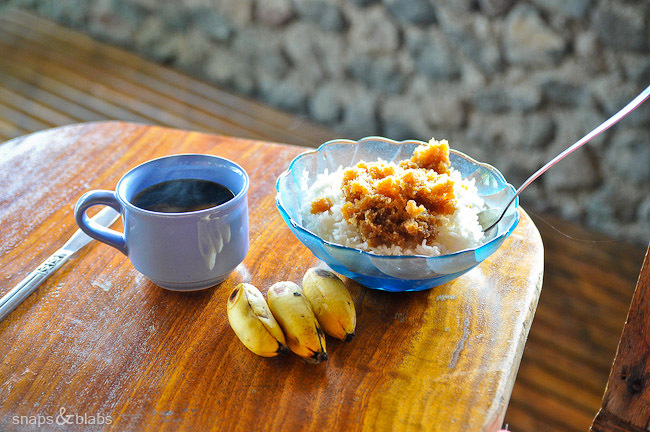 I had mine cold for breakfast, accompanied by bananas and a fresh brew of Bali coffee (I fell in love with that one too). Mango will be, and is the usual, topping for the desert. I made this desert with pandan rice as well – whizzed a few leaves of pandan with some milk and used that on the rice when it was hot. Turned out even better. Ok, so who is trying this? Oh you know I will! ;) I actually have all of those ingredients except the meat of the coconut on hand. It looks yummy!! You use glutinous rice? Its our favorite since we discovered it. 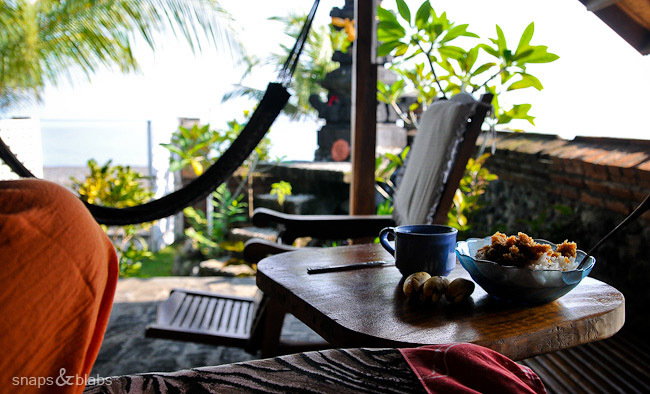 Where we are the local delicacy is made of it and we cant wait to try it. And then there is Thailand awaiting us, which I am sure will feed our glutinous obsession. Try this, its really nice. You bad, bad, bad girl! Looks fantastic! I`ll try to make it…but with “normal” rice, brown (muscovado) sugar and all the coconuts I can find here…th result will never be the same. Bad, bad girl! :) Kisses, keep showing us the world!